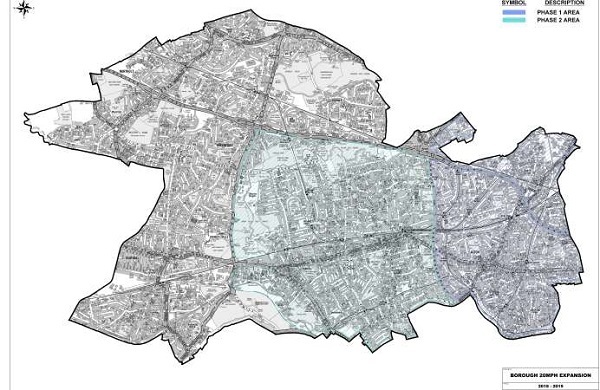 Ealing Council has announced plans for a new 20 mile-per-hour (mph) speed limit in new locations across the borough. Roads enclosed by the A406, A40, Greenford Road, Windmill Lane and the Southern borough boundary will have the reduced speed limit adopted from 31 March 2019. It is the second speed limit to be rolled out across the borough after a 20mph area was made permanent in Acton in 2018 after the council held what they say was a successful one-year trial. The council point to studies which indicate that for every 1mph drop in average vehicle speed there is a 6% drop in road casualties and say the new speed limits aim to make the borough’s streets safer, and more pleasant for everyone using them. They have highlighted a number of initiatives currently underway in the borough which they claim are helping make local roads more attractive for walking, cycling and using public transport. These include enhancements to Sudbury Hill High Street, which were completed last year, and the Live West Ealing programme, aimed at reducing levels of traffic along Uxbridge Road. Julian Bell, leader of Ealing Council said: “We want our roads to be amongst the safest in London and when this trial is implemented we will have 20mph zones or limits on more than two thirds of the roads in Ealing. “Our residents overwhelmingly agree that road safety should be further improved and the introduction of this additional speed limit will help us do just that. “Helping people make that shift away from high-polluting vehicles to greener options wherever possible is central to our transport strategy, which we began to implement last year. “The strategy also sets out our commitment to improving air quality by increasing provision for electric vehicles on a scale not seen in the borough before.